Calendar - Welcome to 2B! We use this calendar as part of our morning routine. 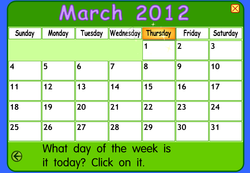 It is a great way to start each day by examining the month, day, and date. We are sure to pay attention to the patterns that we see emerging. Of course, we also recognize any special dates that might be coming up. We can even print out activities to go with the month!